Southbank Precinct, Melbourne, Victoria, Australia. Festivale online magazine pictorial guide to Melbourne and Victoria. 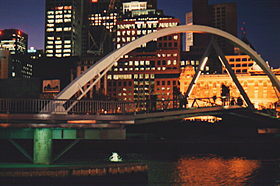 This footbridge connects the Southbank Precinct to the Melbourne Central District. Southgate workers and tourists pass under the tracks of the Flinders Street Station. It is a pleasant way to walk from the city proper to the Casino across the river. On sunny days, especially the riverfront area comes to life and the pleasure craft scuttle back and forth along the Yarra River. The Southbank Wharf has several permanently berthed vessels which travel to such destinations as the Penguin reserve at St Kilda Pier and Williamstown. 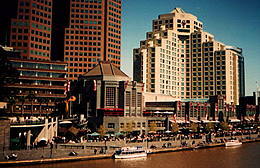 This precinct includes the Arts Centre, and the Crown Casino. Southbank riverside life includes shopping and a range of river vessels. Dec 2015: Southbank Pedestrian Bridge will now be known as Evan Walker Bridge in recognition of the former planning minister. 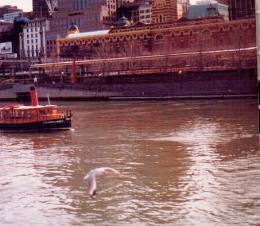 A steamer takes tourists past the historic Flinders Street Railway Station. Getting there: Cross the river from Flinders Street Station.